Ahhh…can you hear that? It’s the sound of forty pounds of puppy power accelerating across your floor! Proud of your pup? Unfortunately, you may not be as they are probably cutting a few extra notches into your flooring. Certain types of hard flooring are more sensitive to pup nails than others. But what kind of advantages does your hard floor offer you? Sure it’s troublesome having to polish and protect it, but can it prove to be beneficial to housetraining? Depending on what kind of floor you have, the likely hood of your pup scratching into the floor varies. Wooden floors, although comfortable and quite beautiful are among the most easily scratched. If you can afford it, oak and maple are the hardest and quite resistant. A few extra coats of urethane should help protect it- and probably make your pup slide around like Elvis. Stone is often expensive, sounds solid and tough, but in truth is very easily scratched. Protective coatings would be necessary to protect this kind of investment. Ceramic and laminated floors are possibly the most resistant type of hard flooring. If you are worried about scratch marks, these would offer you the most viable solution. Unfortunately for your pup, all of these hard floors have one thing in common- they make your pup slide around like a professional baseball player. The clicking that you often hear is not them sliding though- contrary to this it is actually them gaining traction. Most times it is primarily the fur between their paws that causes slippage. Since their nails help them gain traction, pup’s often try to dig them into the flooring and will normally cause scratches. You will need to keep up with trimming their nails to protect your flooring and them. If they catch a nail on the flooring, and it gets pulled out- you may find yourself at the vet’s office. 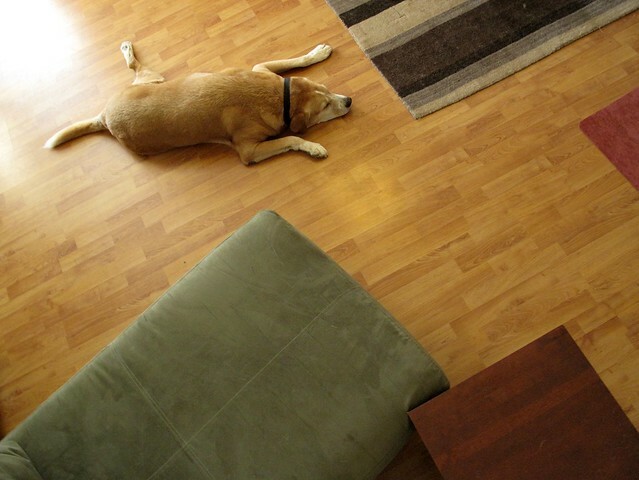 Fortunately, hard floors do offer the advantage of slowing your pup down. They soon discover that heavy acceleration is quite difficult in your home and help to calm them down a bit. Because hard floors are resistant to absorption, cleaning up messes becomes a much easier process. Your puppy has an accident, no worries, a quick mop up and some odor eater applied will save time and effort. If your pup seems uncomfortable within the home, such as finding it hard to lay down somewhere or having difficulty navigating, rugs can offer some assistance. It serves as some relief spots throughout your home and can help keep your pup happy in your home.